How many iOS devices will be produced in 2015? 12 months ago I asked How many iOS devices will be produced in the next 12 months? The answer turned out to be 247 million.1 Including Apple TV the total would probably be around 251 million. Since last year, I adjusted my model by observing corresponding iOS unit shipments for the calendar year corresponding to each fiscal year. Since the calendar year is offset by one quarter (FQ1 = CQ4) looking at calendar year means looking forward one quarter post-spending. I believe this is more accurate as spending generally happens in advance of production. The company is currently anticipating spending $12.4 billion on non-retail CapEx. The spending for last fiscal year was almost exactly what was anticipated in the previous 10K. If we calibrate production (with a 3 month shift) to the 2014 benchmark, then 2015 calendar year would see about 310 million iOS units. Does the company have a deliberate production plan for Apple Watches? What is the lead time? How quickly can production be ramped given channel and demand? 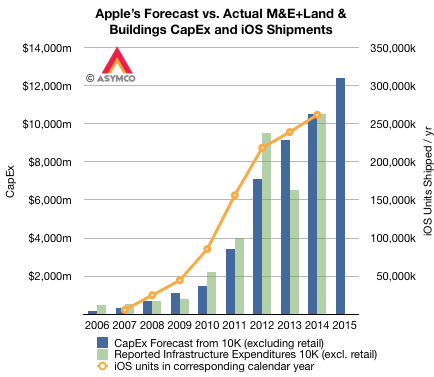 Do Apple Watches require significant capital expenditures? Do Apple Watches require capital intensity similar to iPhones and iPads? How unique are the watch cases, straps and computing cores? What are the demands of the digital crown, the sapphire crystal, the display? The capital budget of $10.5 billion in F2014 had to cover the ramping of the iPhone 6/6Plus as well as some of the new Macs, iPads and the Arizona sapphire plant2. It also had to cover some of the new campus3. In previous years the capital budget also covered data center construction4 which may not be present in the future budget. The non-retail capital budget is anticipated to increase by 18%. There are more moving pieces next year than usual, but directionally at least, CapEx remains a strong indicator of future iOS growth. Especially as it’s given to us a full year in advance.